Choosing a lamp and nightstand for your bedroom doesn’t have to be a stressful ordeal. I know the questions that are running through your mind: Do the colors work together? Is the lamp big enough? Is this enough light for my needs? While style is a personal preference, I can still help you out with your shopping decisions! This one is a basic design principle - make sure your pieces visual weight and actual dimensions are in agreement with one another. I wouldn’t pair a small plug-in sconce with a bulky chest of drawers, just as I wouldn’t pair a tall table lamp with a garden stool style end table. I find it easier to start with finding a nightstand and choosing the lamp second. If you are out shopping for a lamp always keep your nightstand measurements on hand - it will save you the guesswork of wondering whether or not it’s the right size! I recommend finding a table lamp that is similar in height to your nightstand and that the shade width is not greater than the width of the nightstand. If you find a lamp that you love but is a few inches short, try placing it on top of two coffee table style books to boost its height. You also need to keep your mattress height in mind when searching for a nightstand. You have a little wiggle room with size, but I wouldn’t recommend a nightstand that is greater than 4-5” above or below the height of the mattress. You don’t want the bed to dwarf the nightstand, but at the same time you don’t want to stretch to turn off the lamp. How much light do you need in the evening? If you like to read in bed and need a bit more light, a lamp with a drum shade might be a better option for you than a dome or task style lamp meant to direct the light source downward, as on a desk. Another tip is to make sure the bottom of the lampshade is at eye level or below when leaning/sitting in bed. That way you get a diffused light source without the bulb glaring in your eyes! I absolutely love the look of a plug-in sconce, but some of my favorites include a bare bulb which just won’t work for the hour or so when I’m in bed reading. Sigh. Don’t be afraid to play around with the finish, shape or texture of your nightstand and lamp combo, but make sure they work in harmony rather than compete with each other. It’s best not to have both be statement pieces because they will be fighting for the spotlight! Think about each one’s texture and how it might compliment the other - if you have a raised pattern or carvings on your nightstand, perhaps you should go with a smooth, subtle finish for your lamp. Also keep their overall shape in mind - if you have a modern, straight lined nightstand pair it with a lamp with some curves. Or if you are using a tulip style table for your nightstand, try using a pillar style lamp or something that has angular lines in it. HERE ARE A FEW COMBINATIONS I PUT TOGETHER JUST FOR YOU! The first one features a bed using a box spring so the mattress height is around 27” off the ground. The second is a lower, platform style bed with the mattress height at around 20” off of the ground. Don't miss out on the goods. Get design tips + tricks sent right to your inbox! Thank you! Don’t forget to check your email to confirm your subscription! 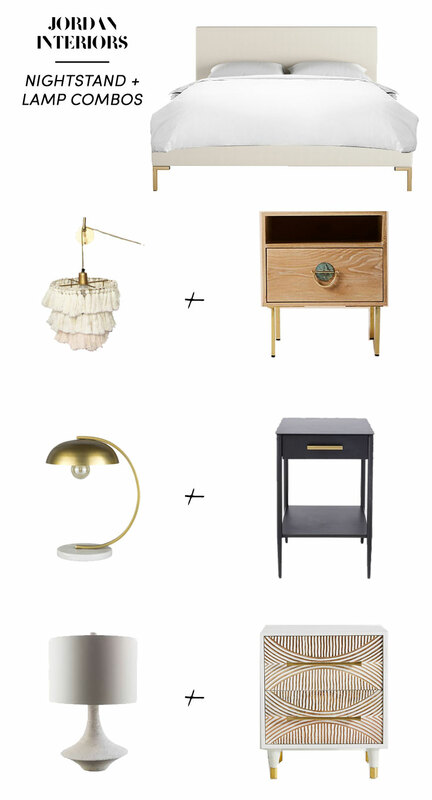 NEED HELP SORTING OUT YOUR BEDSIDE LAMP + NIGHTSTAND COMBINATION? CHECK OUT MY DESIGN SERVICES AND LET’S GET TO WORK!